I added an Instamatic from Kodak to my collection this week. 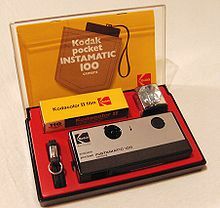 It is the not the first Instamatic that I ever owned. I think I was given one when I was about 12, in 1970. I remember it as the first quality inexpensive no-focus required camera. Everyone had them. Later, I was given a more modern one which used the square lightbulbs (see below - And thanks to Wikipedia for the picture of the Instamatic in its case with the flash bulbs).